With a production crew that you could count on all fingers, even subtracting the one that the crazed star blew off of an extra’s hand with a pistol, and with cameras that the crazed director “liberated” from his film school, this picture was shot in the crazed depths of the Amazon where, the Method running amok, everyone seemed to go as crazy as the movie’s band of 16th-century conquistadors pursuing El Dorado. Playing Pisarro’s lieutenant who finds the expedition’s command falling to him as the body count rises, Polish-German lunatic Klaus Kinski was cast not despite his rages but because of them, which filmmaker Werner Herzog remembered from years before when the actor rented a room at his parents’ house. This tells you something about Herzog, who was determined to match Kinski insanity for insanity, both men literally threatening to shoot each other (and not in a filmic way) and periodically brandishing the firearms to do it. We shouldn’t romanticize Kinski’s psychoses: This is a man accused of sexually abusing his daughters. The picture was a failure back home with audiences of a more Teutonic bent but a sensation in Europe and the States. 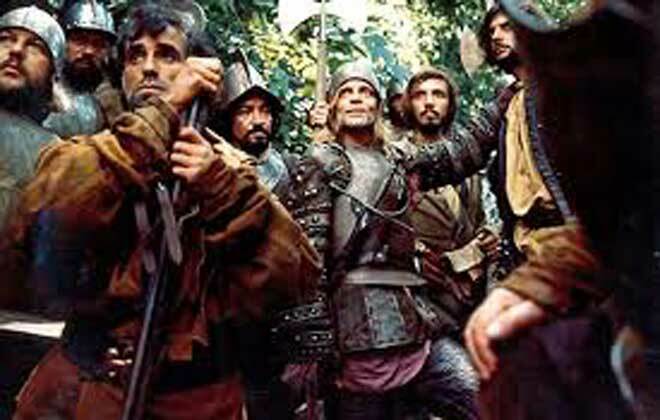 How many times must Francis Coppola have subjected his own barely tethered team to screenings of Aguirre in the Philippines, where Coppola’s own Kurtz pursued Herzog’s into madness? The word “hallucinatory” was invented for this movie, gold-obsessed rapture bleeding into the river the farther into the jungle that the river takes us, swarms of wild monkeys commandeering Aguirre’s vessel. Did Herzog really mean to call his magnum opus the raft of God, and either way, whose wrath is it really? When Kinski rages, God flees the theater before the lights come on. Next articleCulture Shot: Lady Gaga an Art Thief?